So, you ate all the survivors in Humans!! 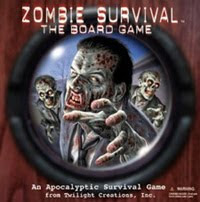 !, survived Zombiegeddon, and you were the last one to die an unimaginable death in Zombie Survival: The Board Game. Your buddies are on the way over and nobody's got to be anywhere soon. The beer fridge is stocked, the chips are down and the salsa is chilled to perfection. What we playing this time? 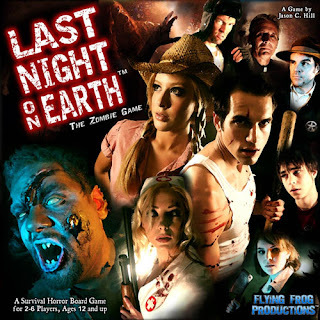 Flying Frog Productions' Last Night on Earth is quite possibly the coolest zombie board game on the planet. It is a perfect mix of survivalist strategy, gun-toting action and long-term re-playability. Set in the sleepy town of Woodinvale you get, among other things, a cast of eight small town heroes (more than you can play all at once), a modular board with a double sided centre-piece, and some of the best miniatures seen (scaled at around 28-32mm, for those who play zombie skirmish games) it even comes with a CD soundtrack to get you in the mood. The mechanics of the game are pretty easy to pick up, but there's enough complexity that is might take a game to get a it right, but once the rules are squared away the possibilities are endless. Best of all the game is scenario based, with 5 scenarios included to get you going and there are currently four more official Last Night on Earth web scenarios. Last Night on Earth has a cinematic action-horror feel so make sure you have plenty of popcorn to hand. The feel and quality of the components are superb and it's a game you can play again and again. Want more? Last Night on Earth: Hero Pack One brings you four new fantastic characters, cards and miniatures, ten new game cards and a brand new scenario. Still want more? 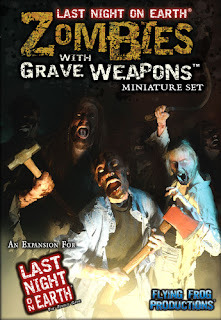 Last Night on Earth: Zombies with Grave Weapons provides 14 plastic zombies, featuring seven new sculpts, to add to your horde and comes with two exclusive new weapons only available with this set. 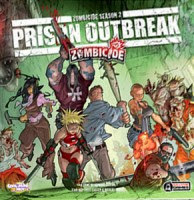 All Things Zombie from Lock 'n' Load games is based on Ed Teixeira's 2006 Origins Award-Winning miniatures game of the same name. 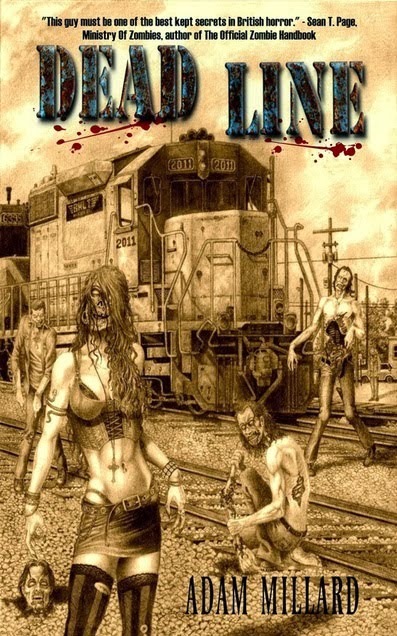 All Things Zombie is a name synonymous with zombie tabletop gamers the world over as one of the finest sets of zombie gaming rules available. 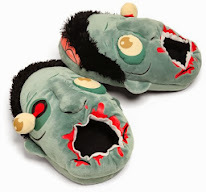 All Things Zombie, otherwise known as ATZ, is all about real life in an unreal world. 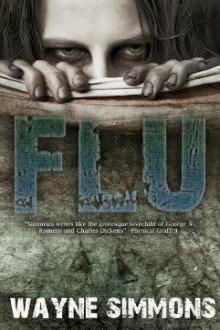 It can be played as a one off game or, when it really comes into its own, as an ongoing campaign in which the same survivors develop from game to game, if they survive. The game features counters in place of miniatures and despite some issues with a small percentage of copies from the first print run, ironed out in the second run, the production is good and the artwork top-notch. 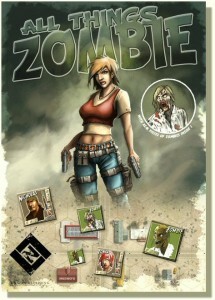 All Things Zombie is designed for 1-6 players, yup that's right, ONE to six. Where ATZ really stands out is its playability as a solo game. No spider solitaire and, in the opinion of many, it's possibly best as a solo game. That's not so common these days. 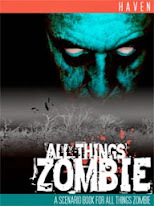 All Things Zombie is scenario-led and the rules cover so much it skirts the boundaries of being RPG-lite and actually works if you want to run it that way. 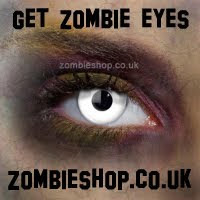 If you want a more in-depth board game you can play solo, fancy an RPG-lite session or like the idea of a zombie skirmish game and don't have the time or modelling skills to build your own zombie infested city, All Things Zombie fits the bill perfectly. 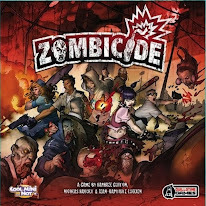 Without any doubt, these are the two finest zombie boardgames available. The production values on both are incredibly high. Not much gets said about the free CD you get with LNoE but I love it. I frequently have it on as background music whilst I'm painting miniature figures. If I had to choose which is best between the two I'd go for the ATZ boardgame, purely for one important reason - it allows for solo play, a huge plus if you're like me - an avid gamer with no gamers to play with. Quote. Last Night on Earth is a very good game, a must have for Zombie Fan. I don't have played ATZ boardgame, but indeed the chance of solo play is a big bonus. Brayn - The LNOE CD is not bad, but if you're in for a long session, best not to put it on repeat. Anatoli - It is superb, cheesy, but it works in its favour in this instance. 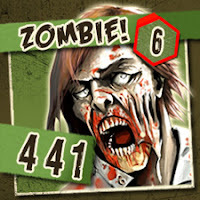 Zerloon - ATZ the Board Game is very similar to All Things Zombie: Beter Dead Than Zed, whith just a few changes. 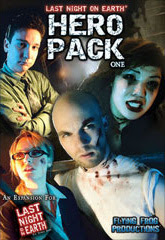 No mention of "MALL OF HORROR" - probably the best zombie-themed game of the lot. Figures. We've not even played it either, so we're very jealous! 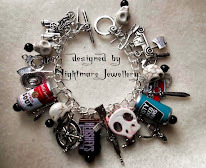 If we had and it was curently available here, it'd be on the list.